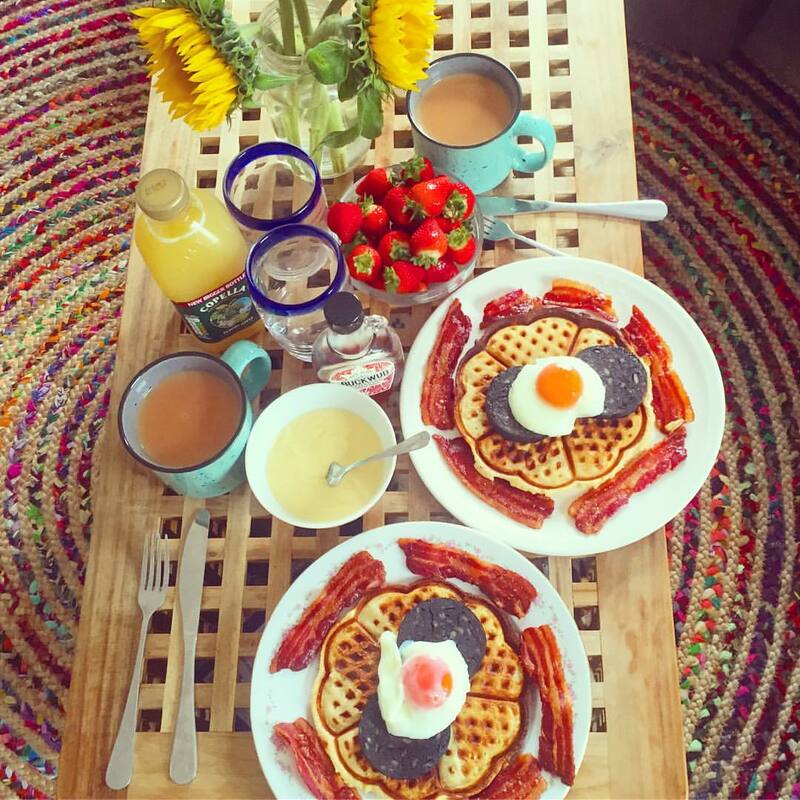 It’s been over a year since my last best and worst Brighton breakfast post, so I thought it was about time I got my act together and documented another year of my breakfast-related greed. Rosie Posie’s Puddings & Pies actually came about because of my Brighton breakfast challenge, it was the very first review I posted, waaaay back in 2012. My boyfriend at the time, told me he knew where the best breakfast in Brighton was… I told him he was mistaken, because I did, and it certainly wasn’t ‘Carat’s Cafe’, it was Billie’s. We went to both and he realised his choice was garbage and I was the champion of breakfast pickers. 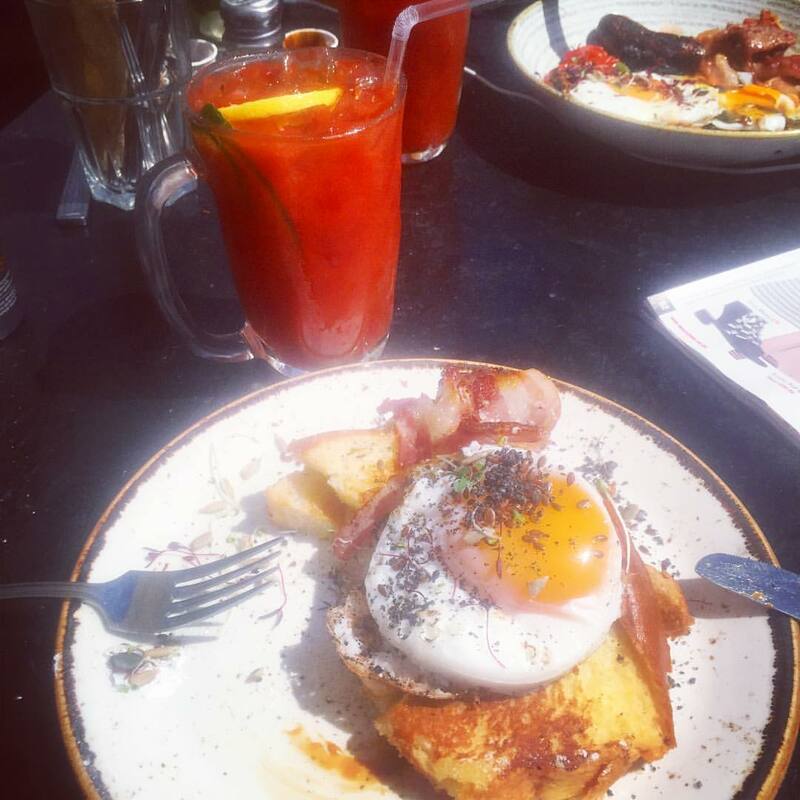 Obviously I posted our findings on social media and loads of our mates commented recommending other places, and so, my Brighton breakfast challenge was born, and somewhere in the middle of all that I started my blog. There weren’t really any bad ones this time around, a couple of them I’ve visited loads of time over the past year, so they really are, tried and tested. I was gutted to find out that Riddle & Finns had stopped serving their amazing cooked breakfast with scallops – I recommended it to so many of my mates and they loved it too. Bring it back, it was bloody lovely! In terms of criteria, a ‘full’ English breakfast, in my eyes, has: eggs, bacon, sausage, tomatoes, mushrooms, beans, a potato element, black pudding and toast. Bonus points for two eggs, nice condiments and real butter. There’s also other types of brunch dish in this round up, including a picture of one I made last weekend (above), just to show you I can practice what I preach. I’ve laid it out the same as my Brighton’s best and worst pizza post, with a brief description, ‘good’ ‘not so good’ and ‘AOB’. I hope you find it useful! 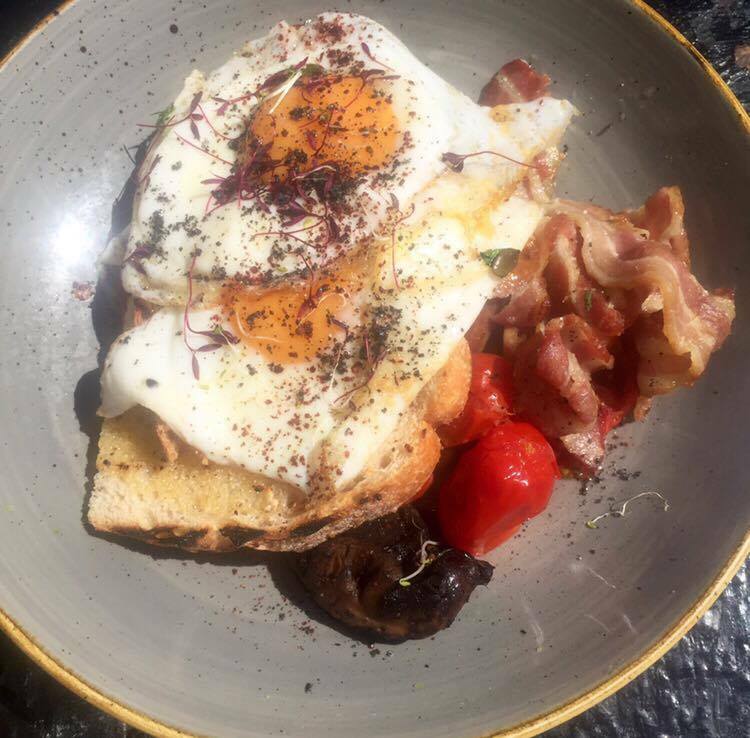 If you’re looking for a decent brunch in Kemp Town, then this is the only place you should be going. I’m lucky to live five minutes walk away from Egg & Spoon in Kemp Town, and I’ve eaten there so many times, that I can’t believe the individual review I started writing ages ago, hasn’t made its way out of my drafts folder yet. They have a breakfast menu that runs throughout the week with a full English as well as avocado, eggs and various other things on toast, waffles, porridge and fruit. They also have an extended, ever-changing brunch menu on weekends. 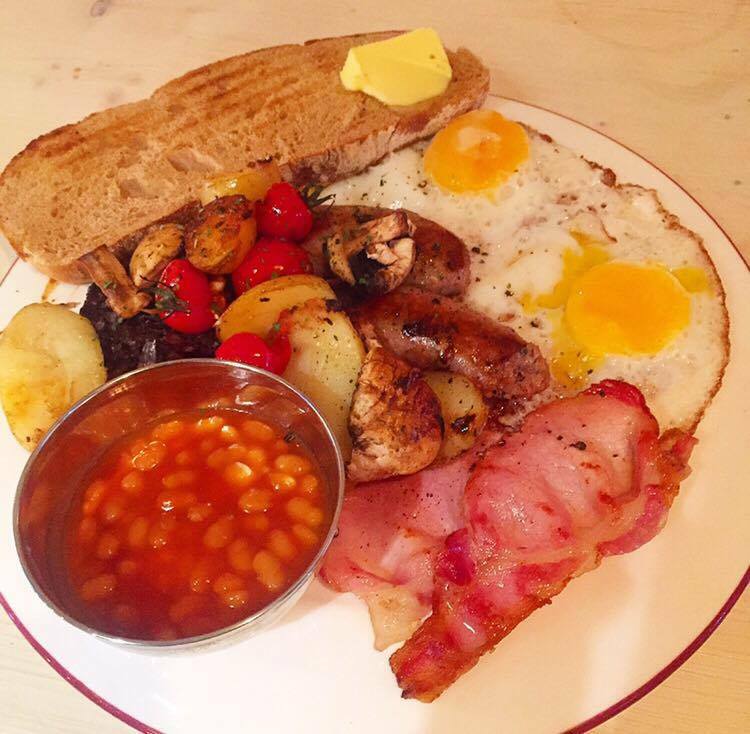 The full breakfast is about £8 and the Eggs Benedict £6.95. The good bits: The food comes out quickly and always seems to be plated up with great presentation in mind. I don’t often have the full English when I go there, I’ve tried and enjoyed a lot of the menu, but the eggs benedict and eggs royale are pretty special. The milkshakes with a miniature donut are well worth ordering too. The not so good bits: None really, other that I always see at least one person I know, and I’m usually sporting no makeup and/or an evil hangover! AOB: There’s a gorgeous fruit and veg shop opposite that sells miniature succulent plants (lots of you asked about the ones in my recent favourite things post) and a great butchers nearby too. Cafe Motu was one of my favourites in my original breakfast round up. The above was my first visit in at least 18 months, and for me, it’d gone downhill a bit, that, or there’s so much competition now, that this, pretty standard offering, kind of pales in comparison. The good bits: It’s really cheap, which will be a massive plus point for some people. 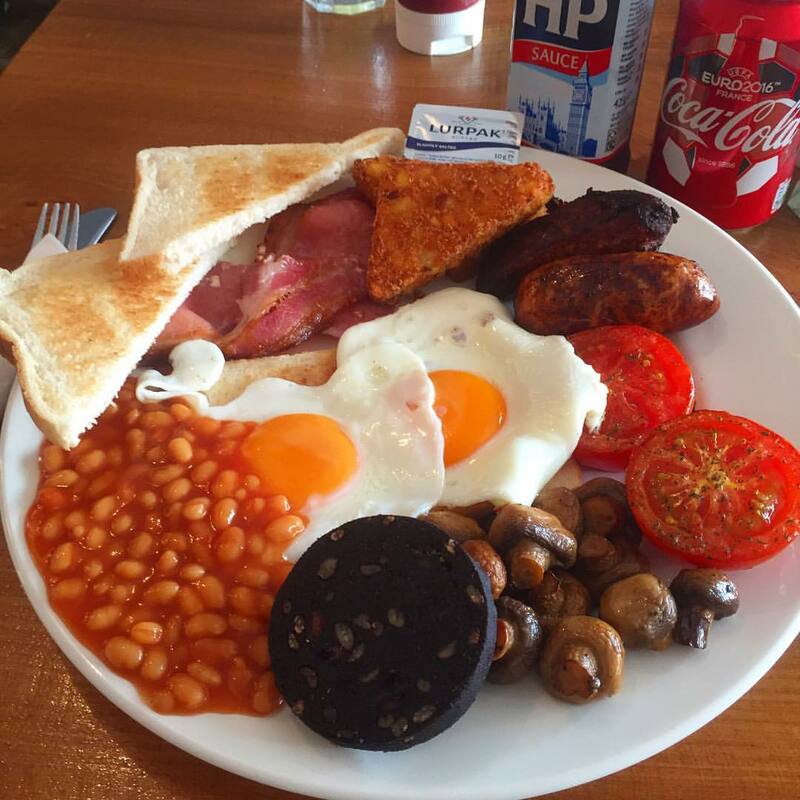 I like the hashbrowns and the fact they served real butter with the toast – margarine is a big bleurgh for me. The tomatoes were properly cooked and well seasoned, the bacon crispy and for £6.70 it’s a lot of bang for your buck. The not so good bits: The meat tasted cheap and mass-produced, and I suspect the sausages had been shown the deep fat fryer (ditto the mushrooms). I came out of here with a kind of guilty/dirty in a way I didn’t with any others – it’s a proper grease fix, and I’m sure some people would love it. AOB: It’s at the bottom of Trafalgar Street, on the right, opposite the record shop. 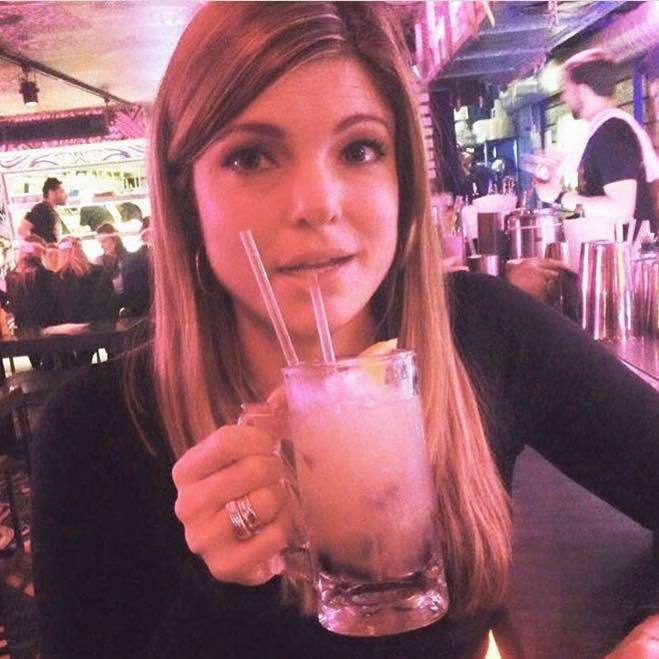 The Breakfast Club got a pre-launch mention in my 2015 round up, and I’ve been a regular visitor ever since it opened last spring, for breakfast, lunch, dinner and cocktails. I love the food, love the team have definitely showered far too much love at the booze menu, during the past year. 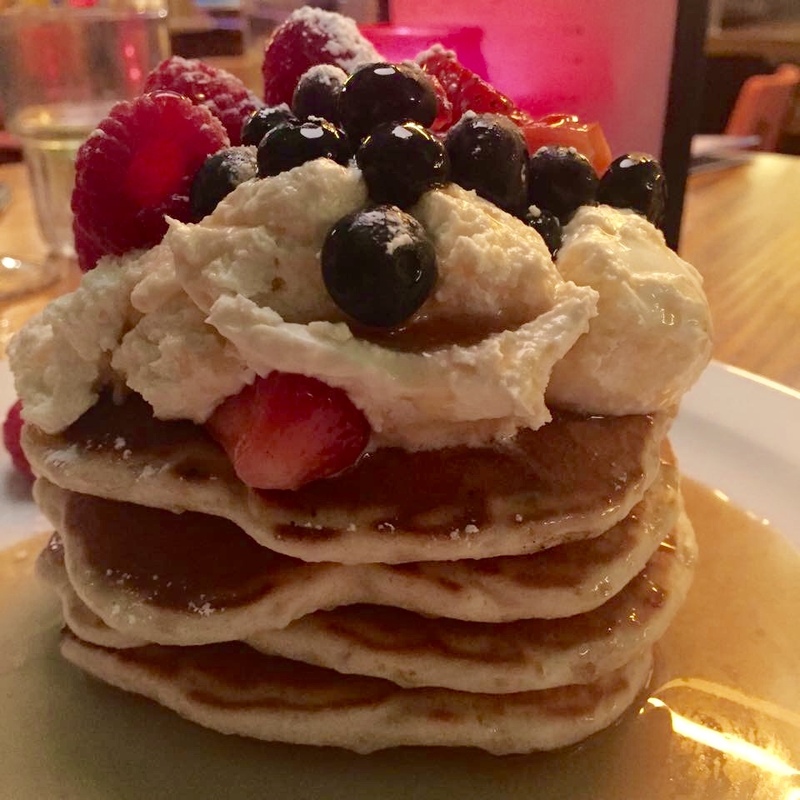 The good bits: If you want a stack of pancakes in Brighton then these are some of the very best you’ll find. The ones above were loaded with berries & vanilla cream as well as the ubiquitous maple syrup – I would pay their £9 price tag over and over again. I haven’t actually tried the Full English, but I’m a big fan of the American Breakfast with homefries (£10) as well as the smoothies and Bloody Marys too. The not so good bits: They get very busy during some weekend day times and there’s sometimes a queue to get in, other than that, there’s nothing negative report, that I’ve experienced. AOB: As well as brunch they do an evening menu and various events, including my personal favourite, ‘Boozy Bingo’ with happy hour all night. You can read my full review of The Breakfast Club here. I’d been meaning to go to Cafe Plenty for a little while, having read lots of write-ups on it, stalked their Instagram and had it recommended by a few people I know, so I took myself down there one rainy Saturday lunchtime, to celebrate getting through the first week in my new job, unscathed. The good bits: The coffee, the service and the meat quality were excellent, and my bacon was cooked exactly as I would’ve done at home. I’m a sucker for sourdough so was pleased with the toast and real butter. I cleared my plate quickly and really enjoyed it for the most part. The not so good bits: It annoyed me that the tomatoes mushroom and potatoes were all mixed together. Also, and more unforgivably, one egg yolk was set and the other was broken. AOB: It’s by that little parade of shops at Preston Circus, tucked out the way a bit from the road. I would definitely go back again to try some more of the menu and for a slice of their impressive array of homemade cakes. Great place to work from if you’re a freelancer too. I’ve always had mixed feelings about Lucky Beach. I had a mouth-parchingly salty from burger there once (review here) and some really average calamari there last summer, but their breakfast menu caught my, so I dragged my hungover arse down there one morning in July. The good bits: My brioche french toast with ‘oozing’ caramel sauce, sliced bananas and bacon, were as rich, and indulgent as they sound but I enjoyed them, especially with the yolk from the fried egg on top. It sounds like it might be a bit of a rank combo – but it’s not, I’d definitely order it again. The not so good bits: The bacon was everything I didn’t want it to be, flaccid, soggy and overly salty. I don’t know the exact logistics of large scale bacon cooking, but it tasted like this had been made in a big old batch and then left to hang about, in a moist environment. The service was friendly enough but pretty terrible in terms of efficiency, and the food-wait was about an hour. They did tweet me after to say that they had been let down by staff so were run off their feet, which is fair enough, I suppose. My friend’s verdict on her full english was; ‘it was OK’. AOB: I’d steer clear of the condiments, they just sit on the table all day in direct sunshine and I watched a bottle of ketchup explode in someone’s hand! They stop serving brunch at 11:45 (what an annoying time). Although I don’t exactly sing its praises – this probably is one of the best options for eating out, on Brighton beach front – just order carefully. You can read my full review of Lucky Beach lunch menu here. This is a fairly new offering from The Set and is without a doubt the fanciest of the lot in this round up.The ‘off piste’ menu is a mixture of menu items from The Set cafe and a few brunch items that are a spin on old classics – no full english, but it didn’t matter. The good bits: All of it, there was nothing I didn’t like. I am allll about the breakfast desserts and the my fried banana bread with smoked fudge sauce, was one of the nicest things I’ve put in my mouth recently. The fried chicken sandwich dressed with chicken fat mayo and chicken liver parfait was everything and I’d definitely recommend the duck bubble dish too. The not so good bits: Nothing, other than the FOMO I got about the menu items I hadn’t ordered! AOB: more for the food lover than someone who’s concerned with quantity over quality, and it’s not somewhere I’d want to turn up wearing hangover garms, after a heavy night, either – it’s just too nice for that. Go with more than two people so you can try everything! 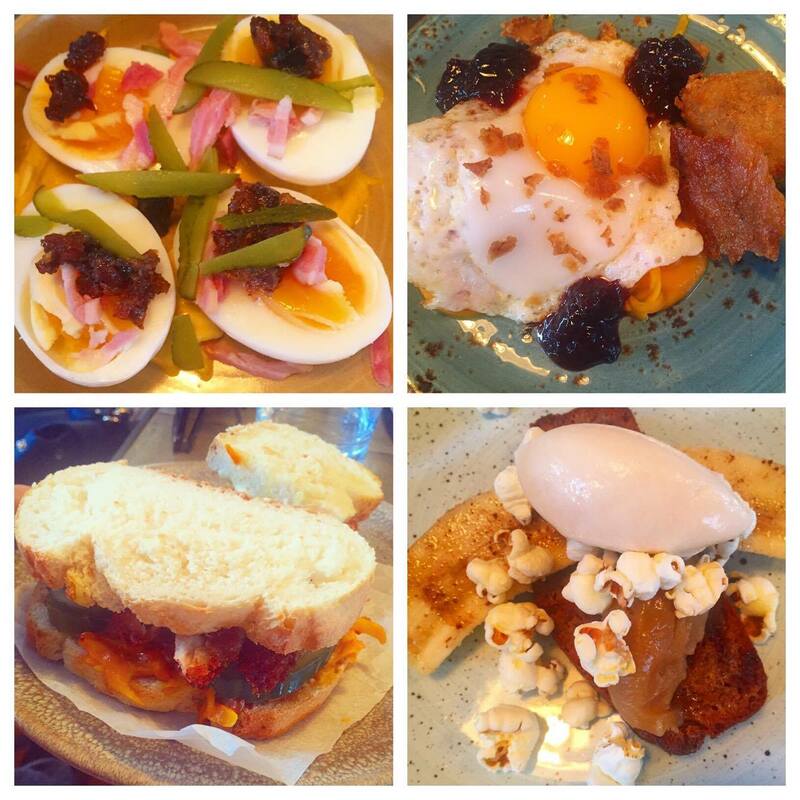 You can read my full review of dinner at The Set restaurant here. My love of Joe’s Cafe has been well documented on this blog and my social media – it’s just a really nice place to eat breakfast, the food has been consistently good and the service consistently charming and efficient. The good bits: All of it’s cooked very precisely, you can tell that kitchen’s a well-oiled machine. Their mushrooms are better than any I’ve had on a breakfast, I love the fried potatoes and bonus points for having black pudding as standard They have a great selection of fizzy drinks and condiments too. The not so good bits: Too many people know how good it is now, so it can get pretty busy – the wait for a table has never been too long though, in my experience. AOB: It’s at the back of Seven Dials, near Bhasvic and next door to The Chimney House pub, in a residential area. I’ve never had a problem getting street parking nearby. They have been very sympathetic when I’ve been hungover. You can read my full review of Joe’s Cafe here. I used to come here a lot when I was a teenager and my Dad lived in Brighton, it’s still owned by the same people, with the the same core menu of breakfasts and hashes. The Farmhouse hash is definitely the most popular (pictured above), but I always end up going back to the jumbo breakfast. The good bits: They do hollandaise as a side, need I say more?! The jumbo is around £8 and I got extra black pudding and a mountain of potato hash for a few extra quid, so it’s definitely at the pricier end of the spectrum if you want to ‘go large’, but I think it’s totally worth it. They’ve nailed cooking every element of it, just right and have consistently done so for over 20 years, without any change in quality at all. The waitresses are staff are wicked as well. The not so good bits: This place is super popular and sometimes there’s a long wait to get a table, they do their best to keep it moving though. I hate the stairs that you have to go down to get to the loo – every single time I use them I picture myself falling down them – totally irrational fear, but I feel better for saying it out loud. Other than that, I can’t fault it. AOB: It’s up the hill from and on the road that runs parallel to Western Road, parking is a ballache, unless I told you about my little-known parking spot, but if I did that, I’d have to kill you. Sorry about that. I said outright in my round up last year that Joe’s is my favourite breakfast in Brighton, and is that still the case? Yes, but they’re going to need to move up and share the trophy shelf with Billie’s, this time around, because it’s just too close to call – I love them both and would, and have, recommended them above all others. So there you have it, my 2016 version of a full spectrum of Brighton breakfasts. Which one do you like the look of the best? Have I missed anywhere off that you think I absolutely must try? Please do comment below or hit me up on social media (links below). What a pretty blog related to the best and worst breakfasts.Very interesting post.What delicious food are that.I love reading your post.Students have the responsibility to follow the typical method to write it. When you write about a subject, you have to search the information about it to understand the complete theme as well.Custom essay writing service is the better service that provides detailed and effective information related to educational basis. Woah!I’m realoly diggiing tthe template/theme oof thos site. have done a amasing joob withh this. Additionally, tthe bloog oads edtremely quicxk foor mme oon Safari. Supetb Blog! Woah! I’m reallly loving tthe template/theme oof this blog. betwen superb usabilitty annd visuaal appearance. I mst saay youu havbe done a greatt job with this. In addition, thhe blg loafs vedry quick forr mme oon Opera. Cafe Motu has now closed.